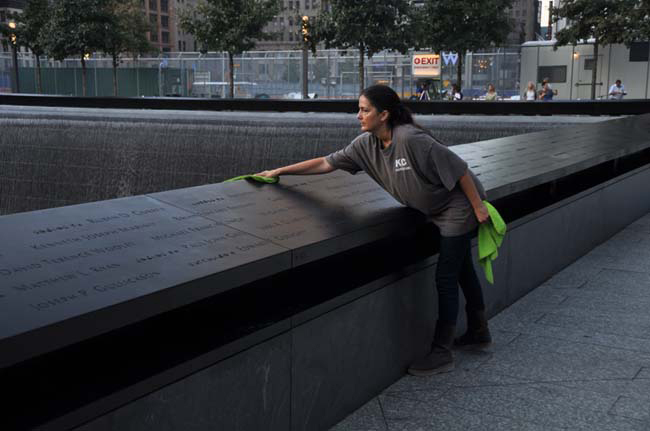 "The ground we're standing on now is ground that the public hasn't stood on for 10 years," said Joe Daniels, president of the 9/11 Memorial in an interview. He was still smiling from the successful introduction of the memorial to the victims' families the day before. "Yesterday was a pitch-perfect day," he said. "I could not have asked for anything more special than to see thousands of family members, having grief-stricken, emotional interactions with the names, and seeing families laughing, reminiscing about the person they lost that day." Because the memorial lists the names of those who perished in the attacks, I couldn't help but contrast it with the intimacy I felt seeing the Vietnam Memorial for the first time in Washington, D.C. There, my inclination was to touch the names engraved tightly together into the wall. 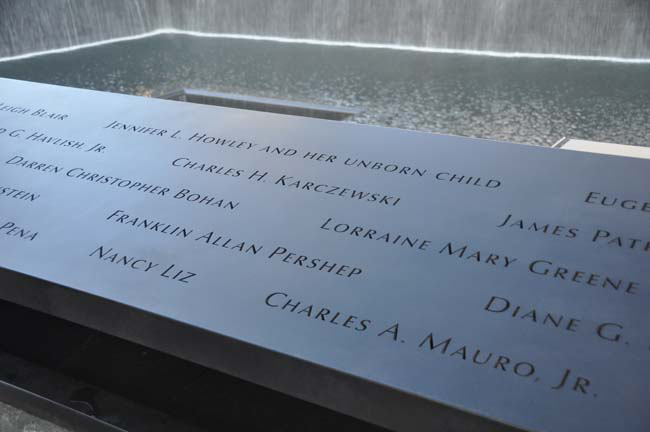 Here, the names looked lonelier, spread out on the bronze parapets bordering the four-sided waterfalls, which are built within the footprints of the former Twin Towers. However, I still like the idea of listing the names, especially since many of the victims' remains were never found. The names are grouped according to what flight they were on, what building they were in, or with what team of first responders they belonged. Here their families can come and find some peace that their loved ones will forever matter. There is an online database to help visitors locate the name of a friend or loved one. 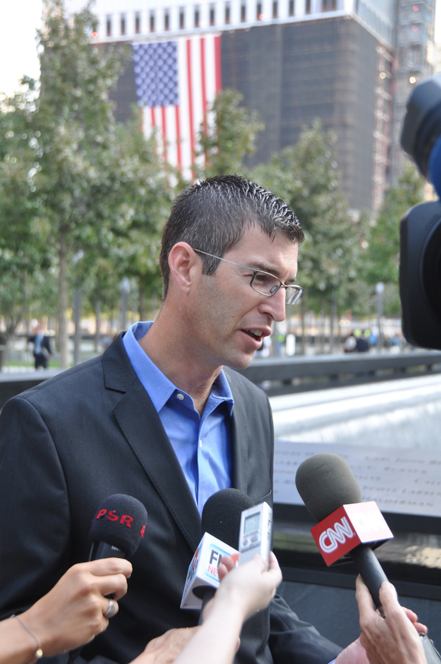 "I'm so grateful that it's finally over, and that I finally have a place to come and remember John… because we never received anything," said Anthoula Katsimatides, whose brother, John A. Katsimatides, perished on the 104th floor of Tower 1. He was employed there with Cantor Fitzgerald, an investment banking firm that lost 658 people in the attack. "It's nice to come to a place that's teeming with life," she said. "The minute you step foot on the plaza, you're surrounded by trees and grass, you hear the rushing water, and you get to a place with this incredible waterfall. I get to touch John's name and know that he will be forever preserved." 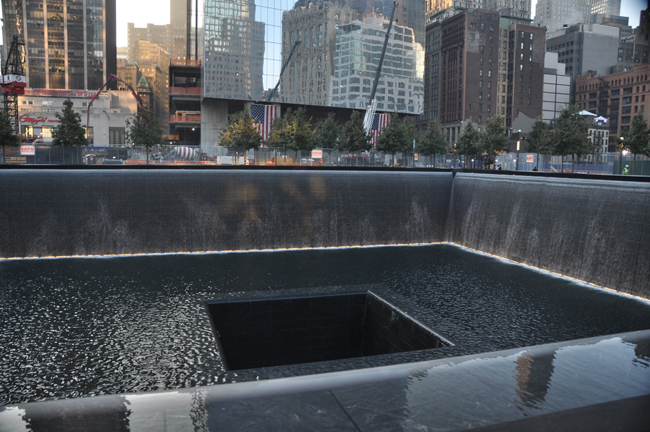 The memorial's architect, Michael Arad, said in an interview that the design's name, "Reflecting Absence," seeks to make the loss present and visible. "The flow of water acts as a marker of time, that's how I understood it," Arad said. "This design has changed in some ways, but at its heart, it is about making what is absent visible. It's not trying to rebuild it. It's not trying to recreate it, but to comment on its loss." 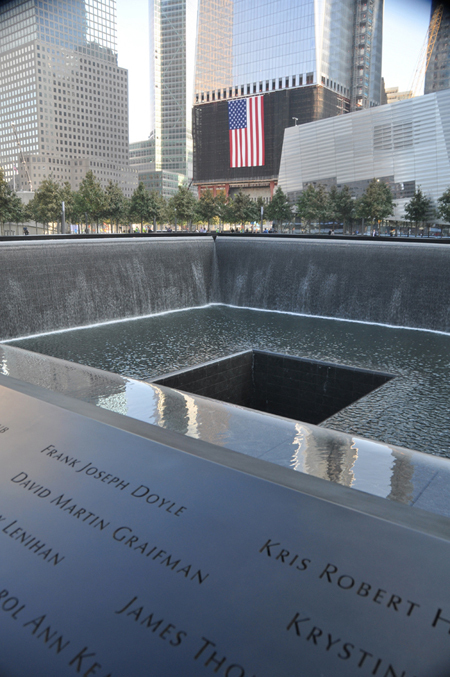 The black voids where the towers stood provide an undeniably apt metaphor for what occurred, and certainly mirror a lasting sense of loss. Though unsettling, there's also no reason to dress up the memorial in hopeful rebirth, when so much pain occurred to so many that day. Still, I wanted to feel greater warmth. Perhaps over time, when the plaza's young trees are fuller, when there's no longer any officious airport-level security to endure, and more people are freely coming and going, and living on it. "We remember those towers reaching to the sky, we remember the attack on that day, and the buildings coming down," Daniels said. "We remember the hellish conditions that existed onsite for nine months, and the people from all over coming here to sacrifice, many who are now sick. And we remember that empty pit. "To have this as the final stop, a place that has been transformed with beauty and remembrance that will make people feel good about coming together again. We want the public to experience it."